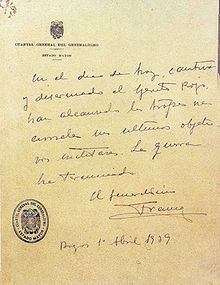 "Los Cuatro Generales" เพลง "Viva La Quince Brigada"
ในช่วงคริสต์ทศวรรษ 1930 เป็นต้นมา สเปนได้กลายมาเป็นจุดสนใจขององค์การลัทธิรักสงบหลายแห่ง อย่างเช่น "Fellowship of Reconciliation", "War Resisters League" และ "War Resisters' International"
ในช่วงระหว่างสงครามได้มีการประหารพลเรือนไปมากกว่า 50,000 คน เมื่อเร็ว ๆ นี้ ได้มีการปรับปรุงข้อมูลเกี่ยวกับสงครามกลางเมืองสเปนขึ้นมาใหม่ แอนโทนี่ บีเวอร์ บอกว่า "ประมาณการของผู้ที่เสียชีวิตจากความน่าสะพรึงกลัวสีขาว คิดเป็น 200,000 คน ส่วนความน่าสะพรึงกลัวสีแดง คิดเป็น 38,000 คน"
Beevor, Antony (2006). The Battle for Spain: The Spanish Civil War 1936-1939. London: Weidenfeld & Nicolson. ISBN 978-0297-848325. Bennett, Scott (2003). Radical Pacifism: The War Resisters League and Gandhian Nonviolence in America, 1915-1963. Syracuse NY: Syracuse University Press. ISBN 0-8156-3028-X. Cox, Geoffrey (1937). The Defence of Madrid. London: Victor Gollancz. ISBN 1 877372 3 84 (reprinted 2006 review). Doyle, Bob (2006). Brigadista – an Irishman's fight against fascism. Dublin: Currach Press. ISBN 1-85607-939-2. Graham, Helen (2002). 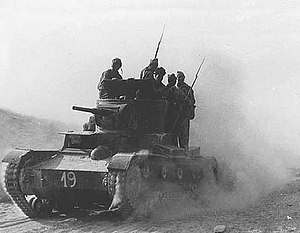 The Spanish republic at war, 1936–1939. Cambridge: Cambridge University Press. ISBN 0-521-45932-X. Ibarruri, Dolores (1976). They Shall Not Pass: the Autobiography of La Pasionaria (translated from El Unico Camino by Dolores Ibarruri). New York: International Publishers. ISBN 0-7178-0468-2. Jackson, Gabriel (1965). The Spanish Republic and the Civil War, 1931–1939. Princeton: Princeton University Press. ISBN 0-691-00757-8. Malraux, André (1941). L'Espoir (Man's Hope). New York: Modern Library. ISBN 0-394-60478-4. Marcos del Olmo, Mª Concepción (2003) ; La Segunda República y la Guerra Civil, Actas editorial, Madrid. Payne, Stanley (2004). The Spanish Civil War, the Soviet Union, and Communism. New Haven; London: Yale University Press. ISBN 0-300-10068-X. Prasad, Devi (2005). War is a Crime Against Humanity: The Story of War Resisters' International. London: War Resisters' International, wri-irg.org. ISBN 0-903517-20-5. Preston, Paul (1978). The Coming of the Spanish Civil War. London: Macmillan. ISBN 0-333-23724-2. Preston, Paul (1996). A Concise history of the Spanish Civil War. London: Fontana. ISBN 978-0006863731. Preston, Paul (2007). The Spanish Civil War: Reaction, Revolution, and Revenge, W. W. Norton and Company, ISBN 0393329879. Puzzo, Dante Anthony (1962). Spain and the Great Powers, 1936–1941. Freeport, N.Y: Books for Libraries Press (originally Columbia University Press, N.Y.). ISBN 0-8369-6868-9. Stradling, Rob (1996). Cardiff and The Spanish Civil War. Cardiff (CF1 6AG): Butetown History and Arts Centre. ISBN 1-898317-06-2. Walters, Guy (2006). Berlin Games – How Hitler Stole the Olympic Dream. London, New York: John Murray (UK), HarperCollins (US). ISBN 0-7195-6783-1, 0-0608-7412-0. Williams, Alun Menai (2004). From the Rhondda to the Ebro: The Story of a Young Life. Pontypool, Wales (NP4 7AG): Warren & Pell. España 1936, pro-Republican documentary by Luis Buñuel. The Spanish Earth (Joris Ivens, 1937; pro-Republican documentary, narrated by Ernest Hemingway and John Dos Passos. The Fallen Sparrow, (Richard Wallace, 1943, from the Dorothy B. Hughes novel; John Garfield played a Spanish Civil War veteran who has returned to New York City to find out the truth about his friend's death). Behold a Pale Horse, (Fred Zinnemann), 1964, loosely based on the life of Catalan anarchist Francisco Sabaté Llopart. ¡Ay, Carmela! (Carlos Saura, Spain/Italy 1990) Comedy/drama about two actors who find themselves on the wrong side of the front line. Land and Freedom (Ken Loach, 1995) The war seen through the eyes of a British volunteer. (สเปน) A description, according to the Vatican, of the religious persecution suffered by Catholics during the Spanish Civil War. The Spanish Revolution, 1936–39 articles & links, from Anarchy Now! หน้านี้แก้ไขล่าสุดเมื่อวันที่ 9 ธันวาคม 2561 เวลา 15:00 น.